Did you know you can make perfect hard-boiled eggs without boiling water? 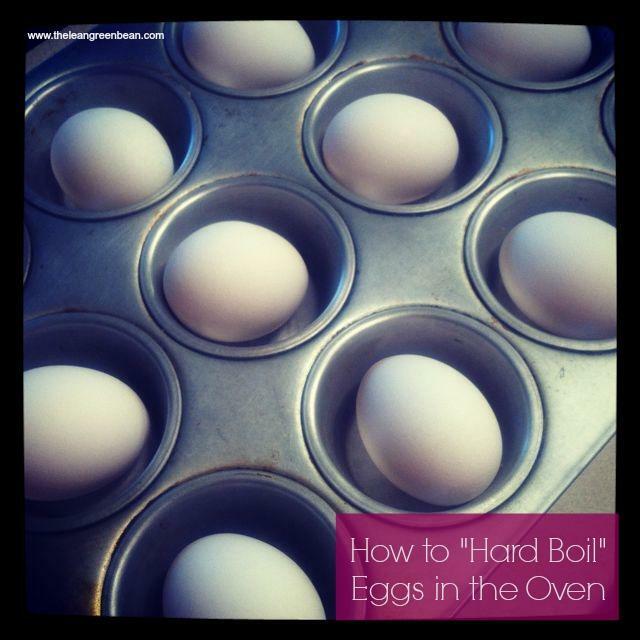 Let me show you how to hard boil eggs in the oven! Things are super busy around here so I’m just popping in with a quick tip. I’m certainly not the first one to use this trick, but I shared it on Instagram last week and got a huge response from people who didn’t know about it, so I thought I’d share it here to spread the knowledge! 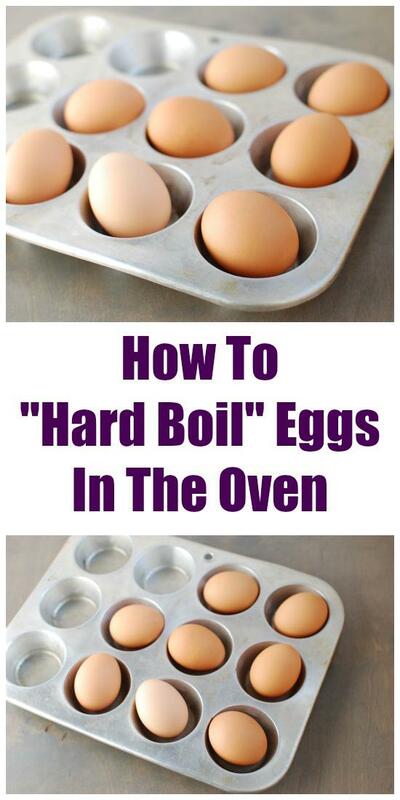 I want to show you how to hard boil eggs in the oven. Yes, you can get perfectly cooked “hard boiled” eggs without even boiling water! It couldn’t be easier! 1. 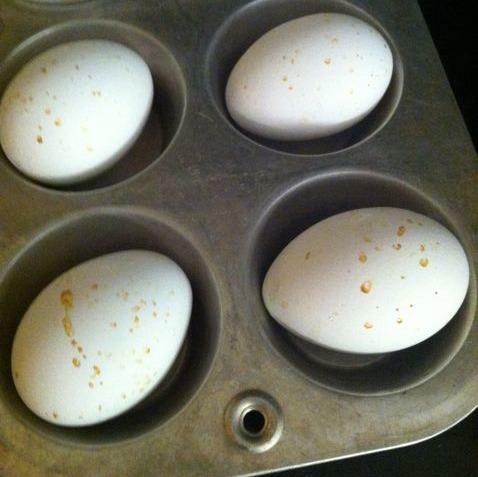 Put your eggs in a muffin tin. You don’t need to put any water in the tins or anything. Just set them in there. If you want to, you can also stand them upright using mini muffin tins. 2. Put the pan in the oven and bake at 350 degrees for 30 minutes. 3. Remove and put the eggs in a bucket of ice water for at least 10 minutes. The only tricky part about this method is that the cooking time will vary from oven to oven. So, if your oven runs hot, you may need to cook them at 325. However, for my oven, if I cook them at 325 for 30 minutes, they don’t cook all the way. So I cook mine for 30-32 minutes at 350 degrees. So, it may take a couple test batches, but let me tell you, once you a little trial and error, this method is AMAZING. So easy and they’ll cook perfectly every time! Just a word of advice. Do a SMALL test batch until you figure out your oven temp. Don’t, say, test 18 eggs all at once if you’re not sure what temperature to use…not that I did that or anything. Luckily eggs are cheap! Don’t worry, they rinse off when you put them in the ice bath! Wait, really?? That’s an awesome tip! I tried this today and my eggs turned out like rubber and were discolored(a brownish colour). I cooked them at 350 for 30 minutes. Sounds like your oven may run hotter than mine. I would decrease the cooking time by 5 minutes and see if that helps! This is really cool! Thank you for the tip. I will try this! I had NOOOOOO idea! Trying this weekend! i didn’t even know this was possible!! neither did I until a few weeks ago! I never knew you could do this!!! Awesome! Huh, that’s so interesting. To say I eat a ton of eggs would be an understatement. This would be a really easy way to “boil” a ton a once! yep! let me know if you try it! Ok…this is purely genius! Amazing! right?! my mind was blown! I do this all the time. I love it. It makes meal prep a lot easier. what?! you just blew my mind! I love hard boiled eggs! I need to try this! what a great tip! my friend does this but i’ve never tried it myself. This is how I do my eggs! SO much easier. Lindsay I’m so happy you shared this! We’ve recently been eating a lot of hard boiled eggs, and they turn out differently every time. Sometimes they’re easy to peel..other days, not so much! I’m definitely trying this method. good luck! let me know how it works for you! wow, I never knew you could hard boil eggs in the oven. Very interesting. me either until a few weeks ago! That is an awesome idea …. This is seriously awesome!! Thank you so much for sharing :). This process sounds much easier than boiling them. That’s crazy! Did you try this all on your own or did you hear of it somewhere also? I’ve gotta try now! Yeah, wow. I had no idea! Although it makes sense. I have an appliance that basically heats up the eggs with hardly any water… the water is really there to steam up the mechanism I think?!? I got it for free, but it does take up extra space, so this might be my replacement for extra things I don’t need! Thanks! well, your small appliance probably uses a lot less energy than running your oven for half hour, so keep that in mind. I love this method, so much easier and nothing to monitor! GENIUS. why didn’t I think of that?? I recall you have mentioned baking eggs before (or perhaps it could have been another blogger) but I’m just curious – what are the benefits/advantages of doing it this way as opposed to boiling them as I generally do? I’d love to try it – but not really sure what makes this way better? BTW – have been following you for about 6 months now. Love the blog – you are a very sharp gal for sure! Keep it up! Nothing makes it better. It’s just another option. For me, it’s easier than having to wait for water to boil. Totally up to you. No nutritional benefit or anything. … several of us were concerned that they might explode… but I haven’t seen anything where anyone else is concerned. Why not? do they, have they, is it a concern at all? or are we all missing something? I haven’t heard about that from anyone who has tried it. Perhaps it’s not a concern because they’re not baking at a super high temperature? Umm, how have I never thought of doing this before – totally never using boiling water again! right?! way less of a hassle! I saw this before on another blog a year or so ago & last the link. Thx for sharing so now I can try again!!!! Do you preheat the oven first or put them in when you first turn it on? Beautiful! Just finished making my first batch this way and they turned out perfect. Thanks for sharing, Lindsay! Does this work with the really fresh eggs? i try not to use really fresh eggs for hardboiled. they’re too hard to peel no matter how you make them! Just an FYI … this page on your site took so long to load that I was a nano-second away from clicking away. However, I’m glad the page finally loaded, because I’m 73 years old and this is my “learn one new thing each day” for today. Trust that I will be trying this tomorrow! Thank you. Woohoo! Glad you liked them! put them in ice cold water right after they come out of the over. or if you boil them on the stove you can add some vinegar to the water! Should the eggs be brought to room temp before putting them into the oven? I always put cold eggs into cold water. Now, with arthritis, and my cookware is heavy, even with the double handle on the sauce pan, it is painful to lift. i usually just start with cold eggs. [WORDPRESS HASHCASH] The comment’s server IP (216.70.97.245) doesn’t match the comment’s URL host IP (208.83.241.147) and so is spam. [WORDPRESS HASHCASH] The comment’s server IP (50.204.238.122) doesn’t match the comment’s URL host IP (50.79.111.163) and so is spam. [WORDPRESS HASHCASH] The comment’s server IP (192.0.99.14) doesn’t match the comment’s URL host IP (192.0.78.13) and so is spam.